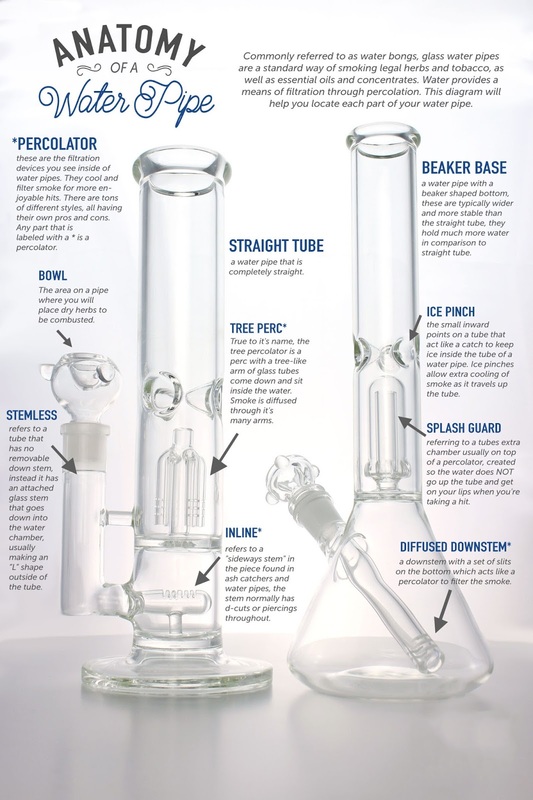 When it comes to water pipes there are a plethora of options.Often, walking into a head shop or glass store can be a hectic experience. You get shown so many pieces you forget what you were originally there to purchase and are then left facing the difficult question: which one is the perfect piece for me? With there being so much variety in shape, size, brand, and appearance it can be rather difficult to compare and choose one piece, especially if you are new to purchasing and using glass. The bowl is the bulbous attachment where dried cannabis flower is loaded and combusted. It’s often removable, allowing it to function as pull- or slide-carburetor. The carb, short for carburetor, is a small hole that allows the user to clear smoke from the entire chamber of the bong, completing the bong toke. The most common type of carb found on glass bongs is a pull- or slide-carb, which is exposed when the bowl is removed. The downstem is the small tube that allows the smoke to travel from the bowl down to the base, where it then percolates through water. The base is the bottom of a bong and can take many shapes, depending on style. A bubble- or beaker-shaped base is often used to create the water chamber in which the smoke cools as it passes through the water. The tube, which ends in the mouthpiece, is the chamber that fills with smoke after it has filtered through the water. Other features, such as an ice pinch, are often included in the tube design. Easily the MASTER perc in our opinion, this perc consists of thousands of shards of glass to create pathways for the smoke to go through. More pathways equal more diffusion. Just a genius pick, but may feature drag.